Update your denim outfit rotation this fall with the coolest new ways to wear mom jeans. From layering pieces like oversize blazers and timeless shoes like sleek black ankle boots to simple sweaters and statement accessories like brightly colored bags, add each combination to your lineup to freshen up your denim style. Today it’s all about how to wear mom jeans and outfits you can wear on repeat no matter the season. We’ve rounded up a selection of denim looks you can wear from anywhere like happy hour to the office by pairing the jean style with the right essentials. To ensure you’re set with the best ideas that you can easily re-create, we’re sharing 25 different outfit combinations. Ahead, you’ll find each look and a styling note to help you add the look to your next denim lineup. Check out creative ways to wear mom jeans below and let us know how you’re styling the cool denim style by using the hashtag #WhoWhatWearing on Instagram. 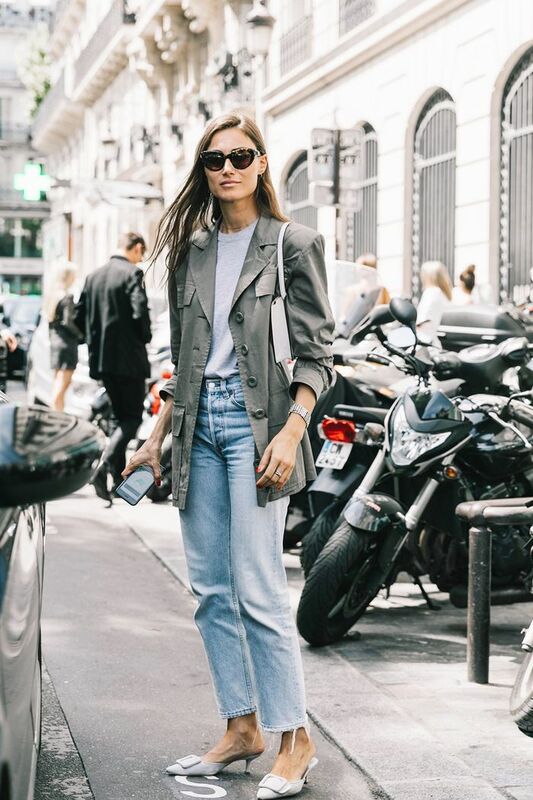 Style your go-to mom jeans with chic kitten heels this weekend. Layer a textured coat with your next denim look. For a relaxed look, wear a shirtdress and statement Oxfords. You can't go wrong with a cozy sweater and comfortable mom jeans. A polka-dot top is the way to go if you're looking to dress up your denim look. Mix prints and metallic for an unexpected combo. Wear an oversize blazer as a top for a casual evening look. Freshen your denim look by tightly cuffing your jeans. Fuzzy slides and simple tops for the win. A statement blouse and a chic bag will instantly update your denim outfit. When in doubt, wear a blazer and crisp white tee. Never forget the power of a statement belt. Layer your hoodie under an oversize jacket for added warmth this winter. Style your graphic tee with a fuzzy coat for a cool weekend outfit. Layer your sweater and oversize button-down for a fresh denim office look. Trench coats and pointed-toe heels make for the perfect combo. Pair your turtleneck with bold earrings and jeans this fall. For a laid-back look, wear a printed sweater and blazer together. We're always suckers for a good denim-on-denim look. Cuff your mom jeans for an unexpected styling look. Pair your jeans with cool patent leather boots this season. Put a fall spin on white mom jeans by styling them in a striped tee. A black turtleneck is a must for layering. Add a baseball cap to your next mom-jean outfit. A leather moto jacket is a fall essential when it comes to styling jeans. This post was originally published at an earlier date and has since been updated. Up next, shop investment pieces to buy now and wear forever.